I’m baaaaack!!! Nine DNCBer’s (Lorna, Gerhard, Paul and home-schooled daughter Quinn, Sheila, Kay, Ken, Roger and me) met at Petra’s last Wednesday, December 5 for my first DNCB outing since returning from 7+ weeks holidaying in Western Australia. 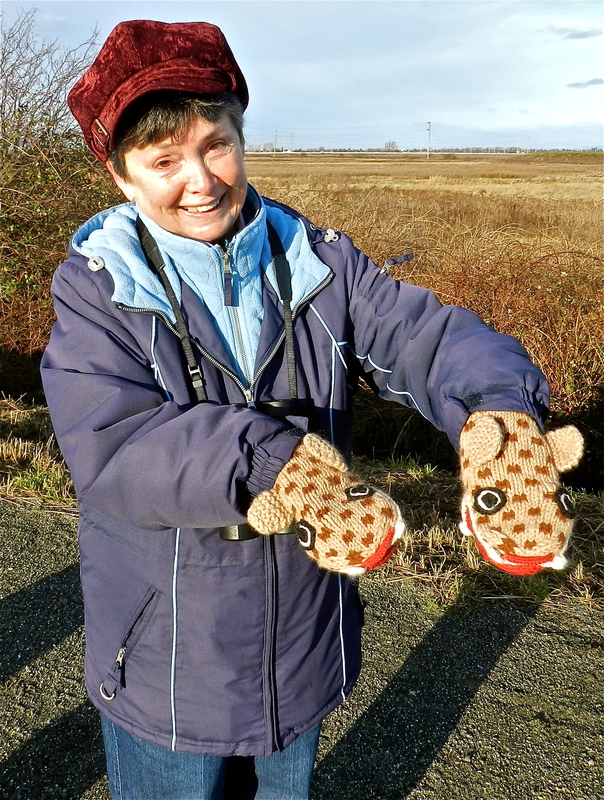 Hi-lites of our outing to Boundary Bay Regional Park (BBRP), then the dike at both 72nd and 64th Streets were: Snowy and Short-eared Owls, Yellow-rumped Warblers, lots of Raptors and Shorebirds, and Lorna’s PB and banana sandwich. 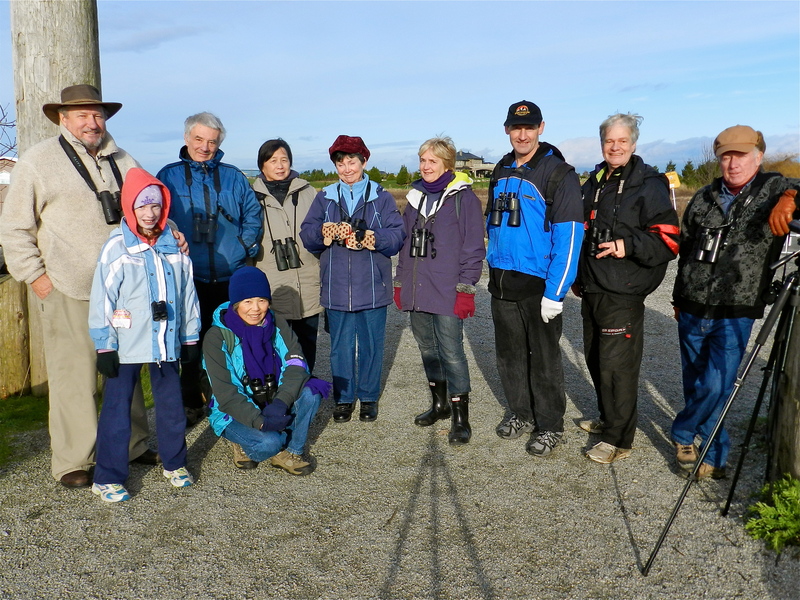 Check out Ken’s brilliant photos of participants and sightings on our Picasa site at http://picasaweb.google.com/dncbirding. We started at the 12th Avenue entrance to BBRP and enjoyed a beautiful sunrise as we walked to the Lookout near the pump station. A flock of Eurasian Collared-Doves were in a tree above the Beach Grove homes. The tide was high, and there were over 50 Lesser Yellowlegs in the lagoon, along with a Hooded Merganser, Buffleheads and Mallards. From the Lookout there were small flocks of Brants among the many Canada Geese and Northern Pintail close to shore. Lots of Lesser Scaup in the distance and one female closer to us. 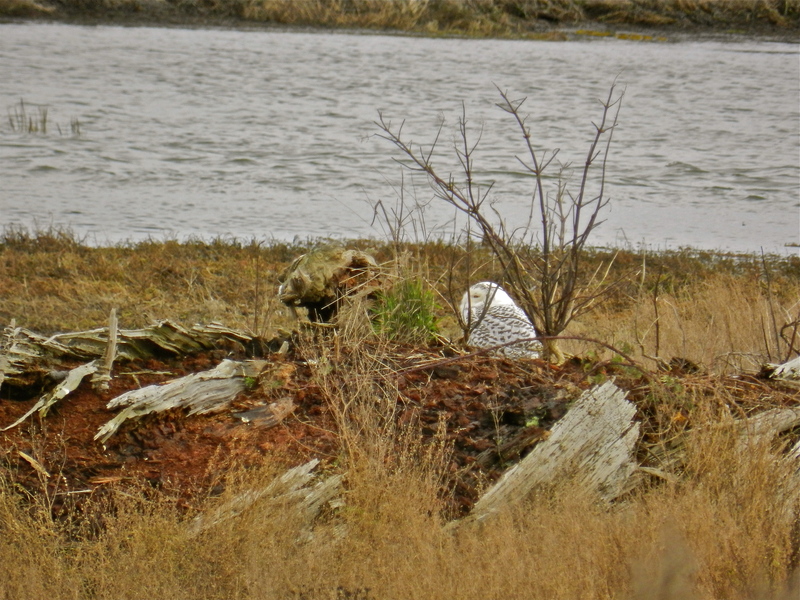 Roger scoped a couple of Snowy Owls across the Bay at 64th Street. An adult Bald Eagle was standing guard on the hydro pole above the Pump Station. After enjoying a nice telephone conversation with the currently incapacitated Hans-Ulf, who we hope recovers quickly (to carry the Scope), we left BBRP and drove to the dike at 72nd Street. 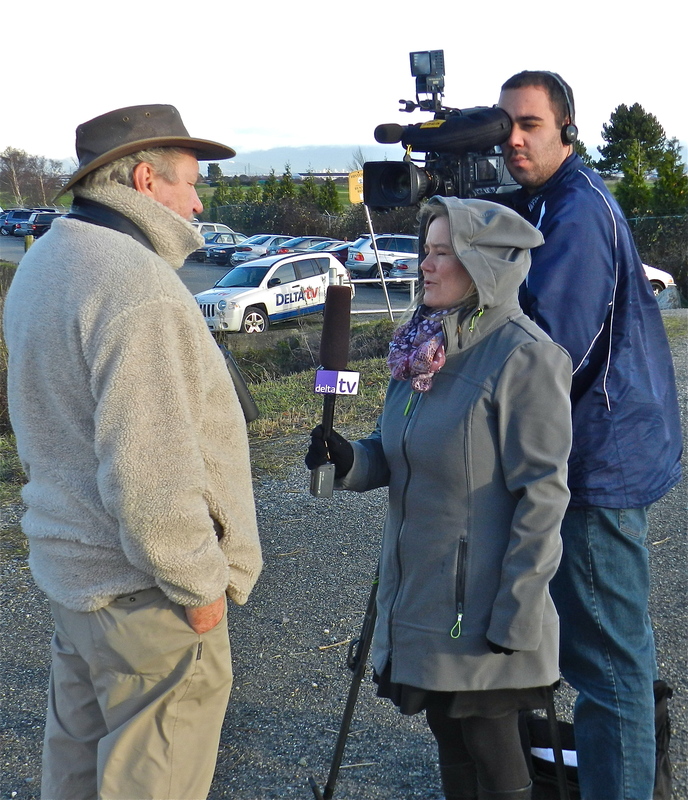 Metro Vancouver Park’s Laurie and Vanessa were also there surveying the scene. We saw a few Snowies (and Hunters), but the Snowies were distant and we knew we would get closer looks at them at 64th Street. So, following our interviews, we drove to the dike at 64th Street. At 64th, we began walking along the dike. Except for me, the group was focused on the shrubs where lots of small birds were flitting, including many Yellow-rumped Warblers (more than I have seen here in Winter), Fox, Song, White- and Golden-crowned Sparrows plus one Lincoln’s Sparrow, and American Robins. I realize that our DNCBer’s have seen many Snowy Owls over the past few weeks, and that these birds are now “old hat” for them. Anyhow, I enjoyed seeing the dozen or so of these majestic animals in the marsh, on the greenhouse roofs, and even occasionally flying by us. On our walk for the next hour we saw lots of other good stuff too including American and Eurasian Wigeon, American Coots, Green-winged Teal and Northern Shovelers in the greenhouse pond. We had a super Raptor morning too with a Merlin flying through the shrubs, a Sharp-shinned Hawk flew over us, a couple of Rough-legged Hawks on a hydro line and in a shrub, a Peregrine Falcon capturing a mole/vole and eating it in a tree. 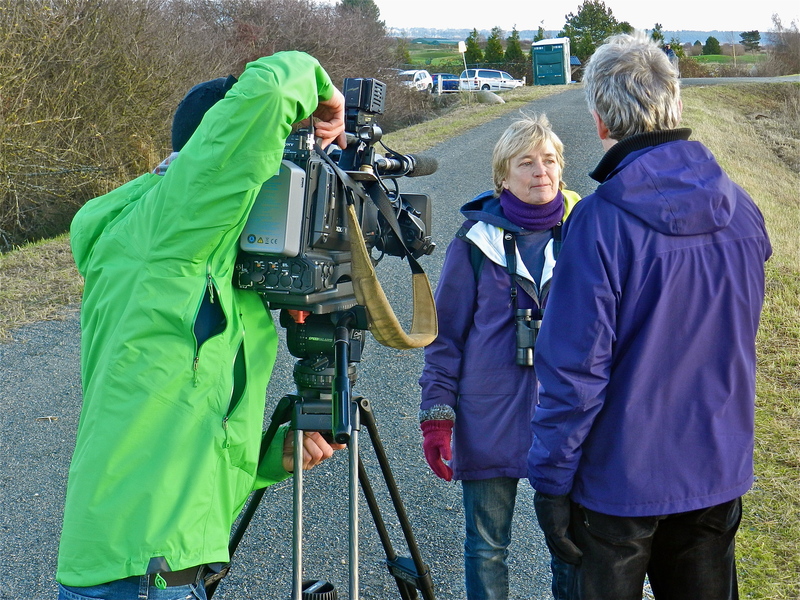 Lorna spotted a Northern Shrike on a shrub on the marsh and her exuberance impressed the CBC folk, along with her colourful mitts. Frankly, the shrike and mitts were nice, but I really enjoyed sharing her peanut butter and banana sandwich. We also saw magnificent rythmic swarms of Dunlin and Black-bellied Plovers fly by us and over the Bay. It really was a grand morning and good to be back in Delta, our birding paradise (although the weather, birding and life style in Western OZ is hard to beat). Next Wednesday, December 12 is our quarterly Birds on the Bay event at BBRP. We will meet at and leave from Cammidge House at 9:00 a.m. on a 2 1/2 hour walk around the park, followed with drinks and goodies at 11:30 a.m. sharp provided by the Delta Nats ladies. Don’t forget our monthly Delta Nats meeting this Monday, Dec. 10 at 7:30 p.m. at Cammidge House with Diane and David Reesor giving a Presentation on their adventures from Greenland to Baffin Island. This entry was posted in *DNCB, 12 Avenue, 64 Street, 72 Street, Bald Eagle, BBRP, Merlin, Peregrine Falcon, Rough-legged Hawk, Sharp-shinned Hawk, Short-eared Owl, Snowy Owl. Bookmark the permalink.